“Mardi Gras” Necklace: A Big and Chunky Jewelry Necklace Displaying a Multitude of Vintage Beads and Vintage Celluloid Buttons. Multi-Colored Trade Beads and Vintage Glass Beads Swirl Around a Twisted Cord Made of Hand Woven African Cloth, Called Aso-Oke. Woven in Nigeria, This Cloth of Red and White Stripes is Inter-woven With Metallic Lurex, and Sparkles Beneath the Shine of the Glass Beads and Buttons. 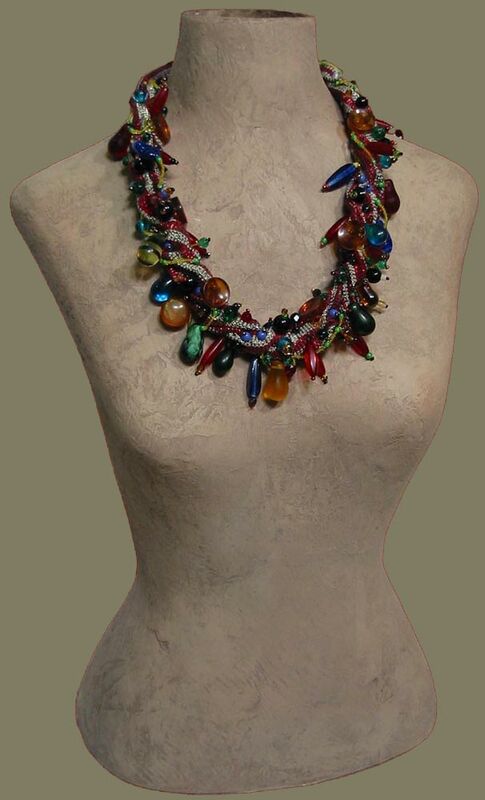 A Unique Artisanawear Jewelry Piece, A One-of-a-Kind Bead Necklace, in a Rainbow of Colors…Amber, Reds, Blues, Greens, and Black. Thread Wrapped Hook and Eye Closure. By Many as a Day to Party Before the Serious Season of Lent!!! Another Designer Original by Carol Tate. Handmade in the Artisanaworks Studio.